The Outing Club’s “Stanton Lodge” at Thorncrag, c. 1955. Photograph by William Rittase. Initial meetings in fall 1919 led to College recognition in January. A faculty vote ensured that women, too, would be “entitled to the privileges of the club,” placing it among the oldest collegiate outing clubs in the country, and making it the first at a private college to include both men and women from the beginning. The group’s initial projects included maintaining hockey rinks and installing lights at Lake Andrews; creating a toboggan run down Mount David, across Mountain Avenue (with city approval) and continuing down Benson Street; and organizing a winter carnival. Inclusive from the get-go, an earlyStudent news story defined the club’s membership and spirit as “every man and woman on the campus,” which over the years has come to include faculty and staff, too, another unique trait of the BOC. 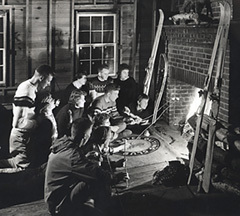 Eighty five years later, the 2004-05 Bates Outing Club maintains some familiar traditions. Weekly meetings are still Wednesday nights at 6:30 and still in the historic meeting room in the Alumni Gym basement. The Equipment Room, once under Parker, is now beneath Hathorn. The Bates community can borrow skis, boots, poles, snowshoes, toboggans, tents, packs and other outdoor equipment for a pittance. 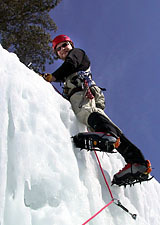 New additions include snowboards, tele-skis, some sea kayaks, skates and updated climbing gear (for the occasional jaunt, seen here, to the Camden Hills). While the BOC still sponsors traditional events, such as Clambake, Winter Carnival games and the Puddle Jump, and offers weekend mountain climbs and canoe trips, its projects are as varied as student interests. A current project is to create a state-of-the-art bouldering wall on campus. Since its inception, the club has tried to offer students a place near campus, to get away, to hang out overnight, or to enjoy just a picnic. Unfortunately, vandals made the BOC’s Thorncrag Cabin unusable in the early ’60s. The Sabattus Cabin also became a target, so council members razed the cabin rather than let it become a wildfire hazard. Later, an alumnus allowed another BOC generation to build a lean-to on his Sabattus land. A destination for campfires and advances (the BOC never “retreats”!) through the 1980s, the land succumbed to the pressure of subdivision and development. In the fall of 1998, club adviser Judith Marden ’66 offered her land in nearby Greene for a new BOC structure. Ben Ayers ’99, then BOC president, gathered friends and volunteers to cut pines and, as a Short Term project in 1999, built a 10-by-17 lean-to, modeled on Appalachian Trail structures. The roof was shingled the following fall, and College chaplain Kerry Maloney blessed the new retreat at its dedication. Subsequently, Marden put a conservation easement on her land, granting the BOC the right to maintain and rebuild the lean-to, or a similar structure, in perpetuity.